TELE2’s cheap sheep invasion ….. 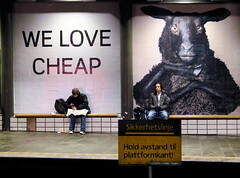 The underground stations of central Oslo have been taken over by super-sized black sheep courtesy of TELE2. TELE2’s previous advertising campaign declared that “we bring you small bills”, now they are bringing us big billboards. They are stuck over walls and pillars everywhere, and are totally invasive. Wherever you walk, stand or sit you are seen to be in relation to the the campaign visuals. Data forensics [in the landscape]. A practical workshop with Martin Howse and Julian Oliver. 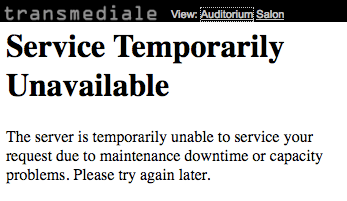 read and perhaps even modulated through the carrier medium itself. archaeological approach to examining everyday digital activity. Mobile Buisiness Magazine, 24 September 2008. Two more photos for the antenna aesthetic collection. 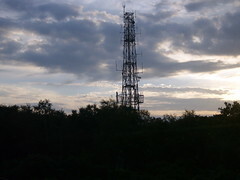 Left: One of the numerous small towers that I spotted dotted along the road side in the New Forest, Hampshire, UK in August 2008. 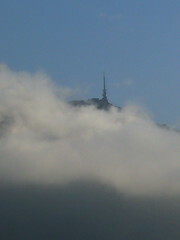 Right: A syringe on top of Ulriken’s Top in Bergen, Norway, Septmeber 25, 2008. Here’s a link to an article published in Aftenposten (Norwegian, 22nd August, 2008) about 12 year old Gaute from Oslo, and his battle to ward off the effects of electromagnetic radiation. This EMV sniffer was put together by Erich Berger and Martin Howse during the Maxwell City Workshop I took part in at Atelier Nord in 2007. It is based on kit components that can be purchased here.